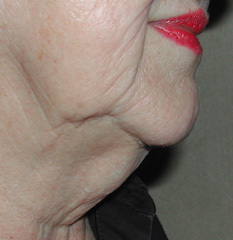 Background: Advanced aging of the neck presents as a turkey neck deformity. Loose skin, excess fat and midline platysma muscle separation create a central droop of the neck that often ends up as a straight line in profile from the chin to the Adam’s apple. Besides its appearance, the laxity of the tissues often swings around from side to side with neck motion. Turkey necks are best treated by a full lower facelift. Only the most aggressive approach to the neck can create a substantial improvement in these most advanced neck aging conditions. However since many of these type necks present in the elderly, extensive facelift surgeries may not be an option. Economics and medical conditions may necessitate alternative approaches even though they produce suboptimal results. Case Study: This 78 year-old female was bothered by her turkey neck deformity which had been getting progressively worse as she got older. While she was aware that a traditional lower facelift was the best treatment option, she did not want to undergo it. She was willing to have surgery but only if it could be done under local anesthesia and was of a more limited nature. Her options were liposuction, a direct neck lift and a submentoplasty. Since she did not want a visible midline neck scar, she opted for the latter. Under local anesthesia her turkey neck was initially moderately defatted by liposuction. A long submental incision was then made and a central skin flap raised down to the thyroid cartilage. The skin flap was elevated up over the chin area and the overlap was excised and closed. When seen one week later for tape and suture removal, a moderate neck improvement could be appreciated. 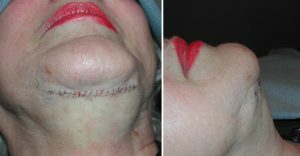 While a submentoplasty is not a good treatment for a turkey neck, it can offer some neck improvement in properly selected patient who understand its limitations. 1) Treatment options for improving changes in the neck can be affected by age, economics and health history. 2) Alternatves to a conventional lower facelift for neck change improvements liposuction, a direct necklift and a submentoplasty. 3) A submentoplasty, while not an ideal neck reshaping procedure for advanced turkey neck deformities, can provide some improvement.